2012 ReFuel electric racing at Laguna Seca ROCKED!!! 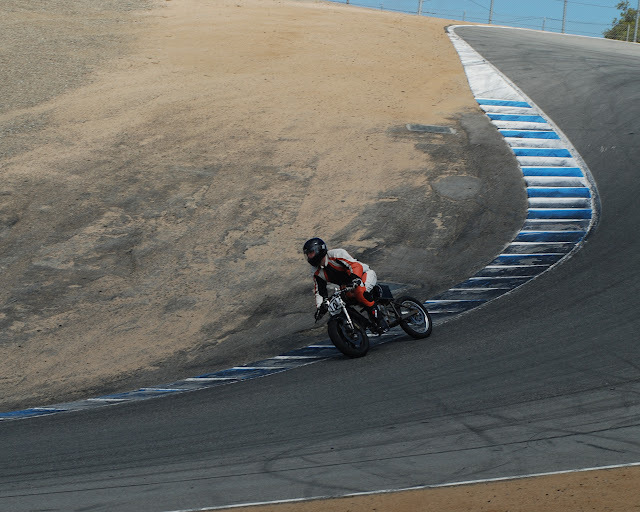 Thread: 2012 ReFuel electric racing at Laguna Seca ROCKED!!! This was one of the most fun days of my life. Had to hard wire the charger into the tracks 220v breaker panel. Long boring riders meeting telling newbs a bunch of newb stuff. Mmmm! I love the feeling like you're falling off a cliff and still need to make a corner. It's just riding bliss. This picture has about 2/3rds of the electric bikes that were racing, many folks were all ready packed up when they took this shot. This is a great crew of folks I have the honor of working with and racing with. Here is an article about the event. Here are some pictures of some of the electric motorcycles that were racing with me. This is my buddy Jamie. He is riding a Zero MX that he modded himself (borrowing a controller from Methods). He was the 2nd fastest motorcycle at Laguna! Only the Brammo bike was faster. This is my buddy Trevor. He is a ripper! This was the fastest bike at Laguna, it's Brammo's TTXGP bike, and it flys. Stock Zero XU even did great on Laguna! This is my buddy Electric Cowboy, and he as riding that Zero like a champ! Knee down! Video of some racing action from on-board my DIY bicycle. Do you know what is modified on the MX ? [QUOTE=liveforphysics;30751]Video of some racing action from on-board my DIY bicycle. DANG.....LOVE the drive up the hill in the video....great exceleration on that DB. Very cool stuff. Looks like everyone had a GREAT time! Added a second Agni 95r, and we're running the pair of them on a 1200amp 116v setup. The pack is made from dirt cheap 4s5Ah hobbyking LiPo packs. At full race pace, it burns 600Wh/mile. My deathbike out accelerates it easily, and has a higher top speed, but he is such a crazy good rider and the bike seems to handle very well for him, his laptime was 2minutes flat, my best laptime was 2.13, so that tells you how amazingly fast he takes the corners. I have a breath taking video of him riding it that I will post up today. I think it's some of the most intense electric motorcycle riding footage in history. just to know .. who is the crazy guy that is running with an EMAX? ( the gray scooter in the first part of the video) ... I have an EMAX .. good brakes , good frame but still a scooter .. have no chances against real moto ... driving an EMAX in laguna seca is something you don't see every day.